Hilton Memorial (3924a-crop) "To the memory of Alec Carter, Arthur Favell and Paul Burmistriw, two city council garbagemen and a 1st class police constable, who were killed here as a result of a bomb explosion on 13th February, 1978. Forever in our thoughts. Your workmates." 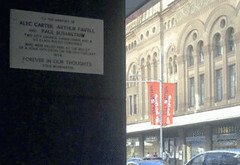 Restored memorial plaque to the 3 dead in the Sydney Hilton Bombing, after major refurbishment of hotel.